CARA’s mission is to ensure that first-generation college students, low-income students, and students of color have the knowledge and support necessary to enroll in and persist through college. CARA’s work confronts the gap in post-secondary guidance faced by first-generation college students in New York City. While New York City public high school students need opportunities to learn about college and career pathways, most of the city’s public high schools and institutions of higher education are not structured to provide this assistance. CARA’s programs, research, and policy work address these inequities. We work with high schools, community-based organizations, and higher education institutions to craft a tailored mix of programs to meet their students’ needs. College Inquiry, CARA’s whole school model, works intensively with schools for 3-4 years, helping them to build their college-going infrastructure and culture. 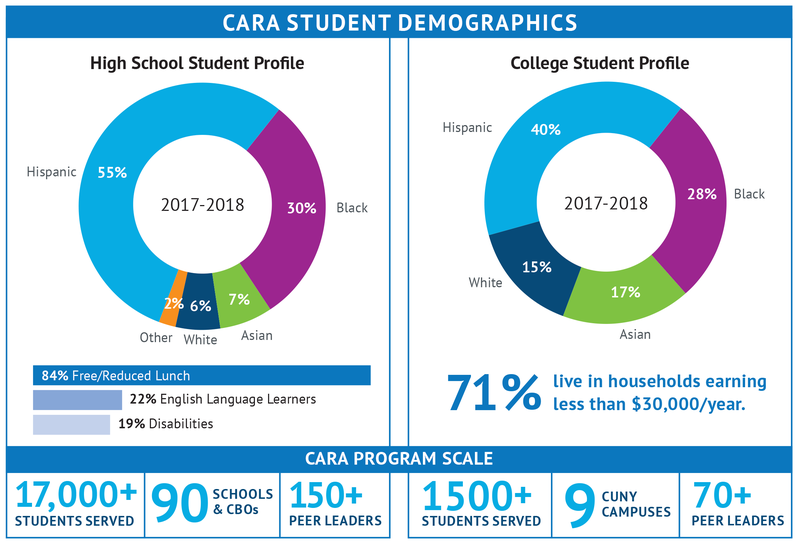 CARA’s peer-led college access and persistence programs - Right to College, College Bridge, and College Allies - help first-generation college students in New York City define and realize their post-secondary aspirations with support from their peers, from application through persistence. Peer Leaders are carefully selected and rigorously trained high school and college students who work within their own schools and communities. They work along various points in the post-secondary access and persistence process, providing one-on-one counseling and group support to help their peers matriculate into and persist through higher education. CARA’s Peer-to-Peer model offers: 70+ hours of peer training; professional development to Peer Leader supervisors; and model development support to leadership. Right to College: Trains and positions high school students to support their peers through the post-secondary planning process. College Bridge: Trains and positions college students to work in their alumni high schools assisting seniors’ application and matriculation process. College Allies: Trains and positions college students to support their peers in college through the obstacles to persistence. CARA conducts research on issues of college access and success and disseminates its findings in a range of formats to inform practitioners, policy makers and the research community. Through collaborations with the NYC Department of Education, CUNY, policy groups, and community-based organizations across NYC, CARA leverages its best practices and scales its program models. We approach both programming and research as tools to achieve greater equity and social justice. We undertake research to inform our practice, and leverage practice to inform research and policy, in all of our work. We recognize the complex culture of schools and organizations and tailor our work accordingly in order to create lasting institutional change. We train and position young people to be a powerful force in their schools and communities, and in the wider world. We help schools to support all students in making informed post-secondary plans and to understand the entire range of options for life after high school. Let us know you're interested in learning more about CARA.